Having distilled his own signature sound of blues and folk for 50 years, Chris Smither is truly an American original. Reviewers and fans from around the world agree that Chris is a profound songwriter and a blistering guitarist, having built a cult reputation as a folk artist, ‘peppering his tunes with rusted blues, country, some jazz and a wise lyric’ (Uncut). Chris melds the styles of his two major influences, Lightnin' Hopkins and Mississippi John Hurt, into his own signature guitar sound. He may be best known for writing ‘Love You Like A Man’ which Bonnie Raitt and, more recently, jazz great Diana Krall have recorded. His music has been covered by numerous artists and featured in soundtrack albums, independent film, television and commercials. “With a weary, well-travelled voice and a serenely intricate finger-picking style, Mr. Smither turns the blues into songs that accept hard-won lessons and try to make peace with fate.” (The New York Times). Chris Smither will be at The Apex on Monday 12 June at 7.30pm. 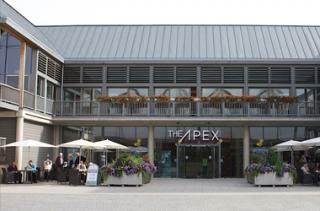 Tickets are £15, ring the Box Office on 01284 758000, or visit www.theapex.co.uk for more information, or to book your tickets.